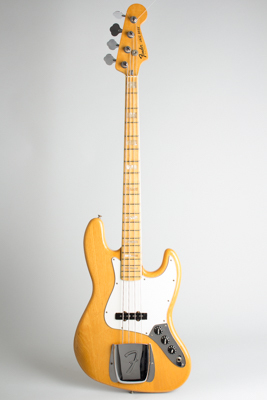 Fender Jazz Bass Model Solid Body Electric Bass Guitar (1978), made in Fullerton, California, serial # S7-37324, natural polyester finish, ash body, maple neck, original black hard shell case. Overall length is 46 3/4 in. (118.7 cm. ), 14 in. (35.6 cm.) wide at lower bout, and 1 5/8 in. (4.1 cm.) in depth, measured at side of rim. Scale length is 34 in. (864 mm.). Width of nut is 1 1/2 in. (38 mm.). This is a nice clean bass overall. a fine player with a few hardware changes. The original black pickguard has been replaced with an aftermarket white guard that does not have holes for the thumbrest or pickup cover, so those parts are gone. The pickups are original (date coded to 1978) as is the wiring; the treble pickup volume pot is original (dated to 1977), while the other two are from 1986. The clear natural Poly finish is nicely preserved overall with some small dings and a little typical checking. The neck is excellent with very little wear, clean frets, and none of the infamous truss rod cracking through the nut issues that are sometimes seen on "bullet rod" Jazz Basses. The bass plays very well with the bright, aggressive sound typical of these later '70s ash-bodied Fender Basses, always popular among poppers'n'slappers. It still resides in its original black HSC, ever ready to bring the funk of 1978 to the modern era any time. Excellent - Condition.